Located in Palau on Eil Malk Island is a marine lake known as Jellyfish Lake. In Palauan, its name is Ongeim'l Tketau, meaning "Fifth Lake" in English. A part of several rocky, mostly uninhabited, small island known as the Rock Islands, Eil Malk Island is located between Peleliu and Koror in the Southern Lagoon of Palau. In total throughout the Rock Islands, there are around seventy other marine lakes, but Jellyfish Lake is the most famous. The lake is called Jellyfish Lake because of the large number of jellyfish that are usually found within it. Thanks to the unique environment and breathtaking natural beauty, the lake is part of a World Heritage Site that features high biodiversity and coral reefs. Each day, golden jellyfish numbering in the millions migrate across Jellyfish Lake. The lake connects to the ocean by an ancient Miocene reef, through tunnels and fissures in the limestone. However, Jellyfish Lake is adequately isolated, as well as conditions being different enough, that the species diversity within the lake is largely less than the nearby lagoon. There are two different jellyfish species that call the lake home, the golden jellyfish and the moon jellyfish. The lake is also well-known for having a high concentration of toxic hydrogen sulfide below around forty feet, making scuba diving in the lake dangerous. This is the reason why only snorkeling is permitted in Jellyfish Lake. Stratified into two different layers, Jellyfish Lake is composed of an oxygenated top layer and an anoxic bottom layer. The lake's oxygen concentration decreases starting at the surface from around five ppm to zero ppm at fifteen meters. Stratification in the lake is constant, and mixing during different seasons does not occur. Jellyfish Lake is also one of the world's around 200 identified saline meromictic lakes. The majority of these lakes, however, are freshwater lakes in origin. Marine lakes that are permanently stratified, like Jellyfish Lake, are unusual. On Eil Malk Island and other islands nearby, however, there are eleven other marine lakes that are apparently permanent stratified. 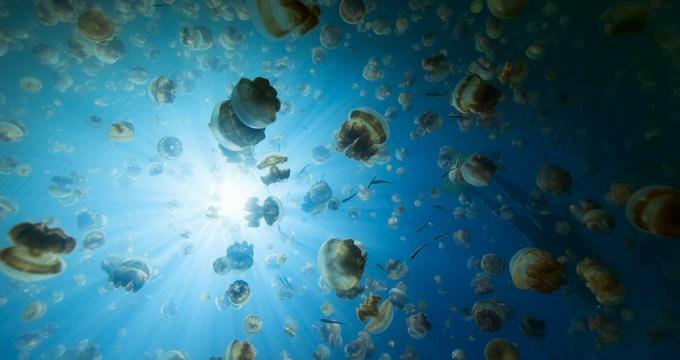 Many adventure-driven travelers have Jellyfish Lake on their bucket list for the goal of swimming in a saltwater lake in Palau with swarms of golden jellyfish. This once-in-a-lifetime experience could be in danger though, according to scientists who warn about the famous jellyfish disappearing. Most likely, the jellyfish live on as polyps, an early phase in their life cycle, attached to the bottom of the lake. If this is true, scientists are optimistic that a new generation of golden jellyfish will create the free swimming attraction that excites tourists once lake conditions improve. Other believe, however, that the long-term future of the unique ecosystem of Jellyfish Lake may be in danger as a result of climate change. The jellyfish, a greatly visible member of the ecosystem, could also be responding to less well-known, subtle changes. The golden jellyfish have just about disappeared from Jellyfish Lake once before in the 1990', but recovered from surviving polyps, so scientists are hopeful the same thing will happen again.